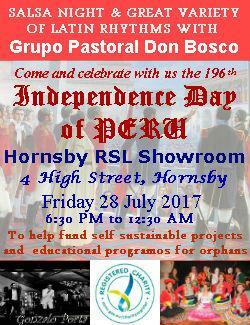 You are cordially invited to celebrate with us the 196th anniversary of the Independence of Perú, which will include a fantastic show performance organised by former and current members of "Te Amo Perú" dancing group, delicious food with Peruvian flavours and lots of dancing with the great Band "Gonzalo Porta & Sydney Salsa All Stars ", hosted by Grupo Pastoral Don Bosco (GPDB). Since 1999, GPDB supports the "Comunidad de Acogida Don Bosco" (Community and Shelter for Youth) in Lima - Perú. Through sponsors contributions and different fund-raising events like this one, GPDB directs all profits to this Shelter Community House to contribute to the development of self-sustainable projects and educational programs. "This is indeed a work of great humanitarian value that needs the support of all of us, so please come and join us on this event"